An error has occurred in WorkflowMax where some Estimated Billings were not cleared after being invoiced based on 'actual time and costs' - this has now been fixed. The error took place when a user opened the financial tab of the same job, while creating a draft invoice and then subsequently approved this invoice. As a result, you will need to review a limited number of timesheets and jobs to identify if time is still available to be billed, or if it has been invoiced more than once. We've put together a step by step guide to help you identify and fix any affected jobs. 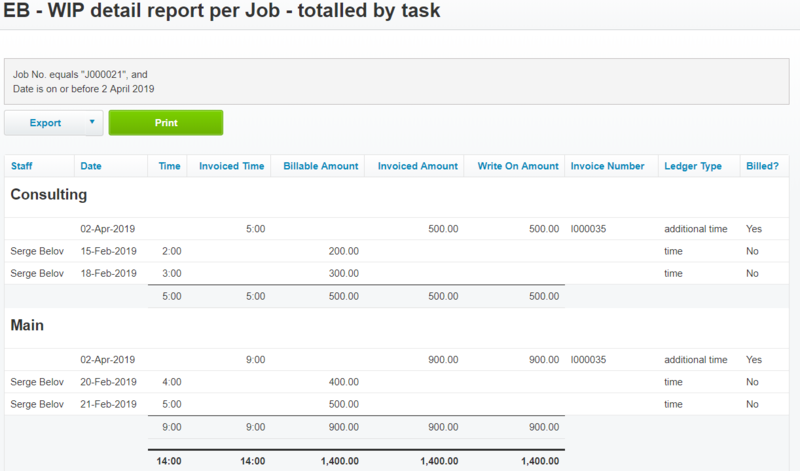 We recommend that you consider how your WorkflowMax organisation is utilising reporting. You need to identify if your organisation uses the WIP Ledger Report in the Report Builder to report on the invoiced and write on/off values of timesheets. The actions required will be determined by the status of the affected jobs and timesheets, and your organisation’s method of reporting. The image below shows a WIP Ledger report and how these invoices have been recorded - the timesheet transactions which have been invoiced are shown as not billed with no invoice or write on values. These values are recorded on an ‘Additional time’ transaction created incorrectly when the invoice was approved. Please click on the buttons below to show the steps you need to take to correct the data on the affected invoices.